Yesterday, at a Congressional hearing I attended in Washington, D.C., Senator Sherrod Brown (D-OH) and Rep. Chris Smith (R-NJ) expressed deep concern about the safety of processed chicken and pet treats imported from China. As many of you know, I have a petition on Change.org (with co-petitioners Bettina Elias Siegel and Barbara Kowalcyk) titled “Congress: Keep Chinese Chicken Out of Our Schools and Supermarkets,” that currently has over 323,000 signatures. We’ve been working closely with Rep. Rosa DeLauro (D-CT) to ensure that chicken processed in China is not served to students in the National School Lunch Program and that China cannot eventually ship its own slaughtered poultry to this country. In his opening remarks, Senator Brown, who chairs the Congressional-Executive Commission on China, set the tone for the hearing by stating, “Americans want to know where their foods come from and want to make sure that everything is being done to keep it safe.” With the FDA recently reporting 5,600 pet illnesses, 1,000 dog deaths and three human illnesses tied to Chinese-made pet jerky treats, and the USDA reaffirming last August that China’s poultry processing system is equivalent to that of the United States, I’m glad to see more legislators investigating the safety of foods imported from China. Panelists at the hearing were Dr. Daniel L. Engeljohn of the Food Safety Inspection Service (FSIS) of the USDA; Tracey Forfa, J.D., of the Center for Veterinary Medicine at the FDA; Shaun Kennedy of the Food System Institute, LLC and a professor in the Department of Veterinary Population Medicine at the University of Minnesota; Patty Lovera of Food and Water Watch; and Christopher D’Urso, a student and consumer advocate. China is getting closer to exporting Chinese-processed American, Canadian and Chilean-raised chicken to the U.S. China has provided USDA with a list of four plants it has certified as eligible to export processed chicken to the U.S. according to Dr. Engeljohn. 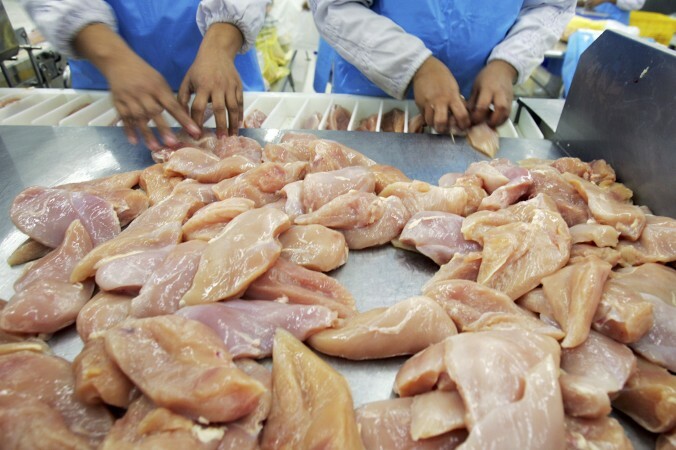 Before any processed chicken can be exported to the U.S., an export health certificate must demonstrate that the poultry is sourced from the US, Canada or Chile and that the poultry is cooked to a proper temperature, among other things. Once the certificate is approved by USDA’s FSIS and Animal and Plant Health Inspection Service, China will then be able to determine when to begin shipping processed poultry products from the plants to the U.S. Dr. Englejohn informed the panel that such a certificate, in draft form, was submitted by China to FSIS earlier this month, which means that Chinese-processed chicken in this country may soon be a reality. Processed chicken from China that is further processed or repacked in the U.S. would definitely not include information on its label that the product was processed in China. Dr. Engeljohn said that because processed poultry from China must be cooked, FSIS believes that is it unlikely that the product would be repacked or further processed in the U.S. and therefore it would have a label indicating that it was processed in China. But that may not be the case. If a company incorporates cooked, processed chicken into products like soups, raviolis and sauces, then under current regulations the label on the finished product would not have to disclose the Chinese processing. FSIS is currently working closely with China on slaughtered poultry equivalency approval and they are close to meeting U.S. standards. According to Dr. Engeljohn, the domestic system for poultry slaughter in China is very different than the system in the U.S. FSIS is in the process of working with China to create a system that meets the U.S. standard. He also stated that China has been making “corrective measures” in their slaughtered poultry system. This means that China could soon be sending its own slaughtered poultry to this country. But in my opinion and that of my co-petitioners, this development raises two concerns. First, even if the slaughtering plants are ultimately approved by FSIS, there will be no on-site inspection to ensure ongoing compliance with our food safety standards. Second, chickens raised in China’s highly polluted environment could pose a potential health threat apart from the adequacy of China’s slaughtering practices. Rep. Smith hammered on the theme of whether the Chinese government was providing trustworthy documentation to the USDA on their processing facilities and manufacturing processes. Smith pointed out China’s rampant corruption and its government’s penchant for “misinformation, lying and deceit.” Dr. Engeljohn countered with information about USDA’s on-site audits in China, testing of imported Chinese processed chicken for drugs and pathogens, re-inspection procedures at U.S. ports of entry and USDA’s ability to quickly respond to press reports with inspections. Apparently, the drug and pathogen testing is done for “new countries.” In other words, the testing may occur when China starts exporting processed chicken, but won’t continue indefinitely. Also, it was noted that China learns of an on-site inspection about two months in advance. That’s because it takes 60 days to process Chinese visas for the inspection team. An outbreak of porcine epidemic diarrhea virus in the United States might be linked to pet food produced in China. Shaun Kennedy acknowledged the possible link, although it’s still being investigated. FDA has performed over 1,000 tests on suspect Chinese pet jerky treats. According to FDA’s Tracey Forfa, the tests so far have been inconclusive. Rep. Smith, who co-chairs the Congressional-Executive Commission on China, grilled Forfa about whether the labeling of so-called “Made in the USA” pet products was accurate. Forfa could not assure that dog treats labeled “Made in the USA” did not contain ingredients from other countries, including China. Finally, I was not reassured by Dr. Engeljohn’s statement that “Yes, we are confident that (China is) maintaining the (poultry processing facility) inspection system we designed to meet our requirements.” After learning that the USDA relied on documentation provided by China to determine equivalency and will continue to rely on Chinese documentation (or “evidence” as Dr. Engeljohn called it) to monitor compliance, I feel even more skeptical. As Rep. Smith pointed out, China’s records could be easily falsified, and unlike the U.S., there’s no threat of prosecution to those who tamper with records.